Due to popular request (well, that and it’s just a really good idea!) 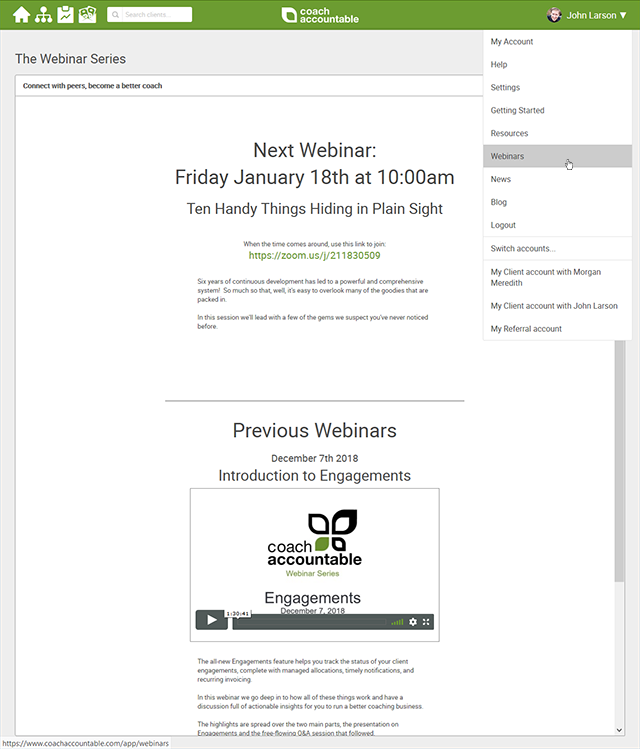 we’re going to be hosting a regular monthly webinar for users of CoachAccountable. Why’s it a good idea and why’s it popularly requested? Webinars have traditionally been an occasion for us to show off new things we’ve added to the system, and to teach how to best use this or that for one’s practice or workflows. We’ve hosted these webinars only very occasionally (2-3 times a year), not wanting to clog people’s inboxes with anything but notices of REALLY BIG stuff. Certainly, however, things move fast enough and the system is rich enough (full of handy features, old and new, that are easily missed) that we could present on a useful topic at a much more regular clip. But perhaps even better than that is how, when we’ve done them, webinars invariably turn into a forum of coaches asking insightful questions and sharing best practices based on experiences. This sort of user community of peers helping peers is where we see the real magic, with attendees leaving grateful that they showed up and excited to up their game by using more of what CA provides. It’s like a mastermind community that meets once a month to share ideas and everyone’s a better coach for it. A webinar every month. We’ll lead with a topic of our choosing, announced in advance. Hopefully something of interest to you specifically, and certainly something that will get the conversation rolling. The “scripted” portion will last 10-20 minutes, and the rest of the time is open for general conversations, questions, sharing, and learning. If history is any indication, this Q&A portion is the lively part of the show. Come with your own questions, or just sit back and learn from others. Webinars are scheduled for an hour, though we’re happy to go over if the conversation remains lively and folks want to stick around (they always go over, and of course everyone’s welcome to sign off whenever they’ve gotten their fill). I’m interested! OR I’m NOT interested! Remember what I said about not wanting to clog anyone’s inbox? With more routine webinars, each entailing a few emails (announcement of one upcoming/notification that the webinar is now open/hey thanks for coming, here’s the recording), we’d run the risk of annoying people if we sent to all active coaches every time, so we’re not going to. Instead, everyone has the option to get (or not get) those notices as they see fit: either by email, an in-app alert, both, or neither. To set your preference, simply go to My Account >> Message Preferences. By default Webinar announcements are set to come to you as an app alert, and notifications of a now-starting webinar are turned off. So if you want to opt in to getting either or both of those via email, head over to My Account >> Message Preferences. Can I See Past Recordings? Yep! Within your own account, from the top right user menu go to Webinars. There you’ll see not only a notice of when the next one is coming up, but also the collection of past webinars, ready for viewing and complete with show notes so that you can surf parts of interest. Right there for your reference at any time. 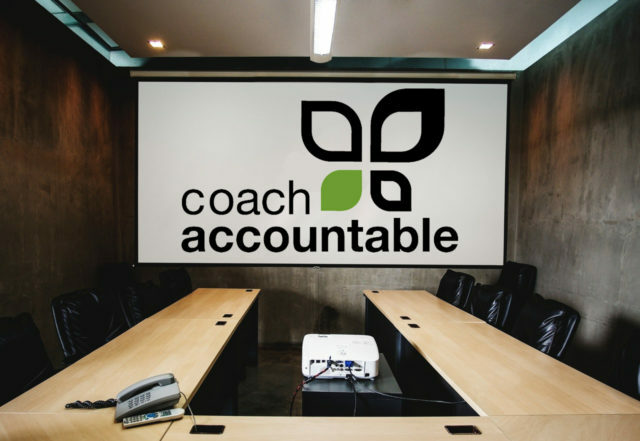 We’re excited to hang out and share knowledge with the CoachAccountable community more often, and look forward to building this as an early-stage de facto users group. We hope you’ll join us and have it breathe new life and inspiration into your coaching practice! This is good news John. I’m sure that these monthly webinars will work well. It’s also a good idea to manage notifications and access to previous webinars within the platform. It seems inevitable that coaches will learn how to use CA more effectively. Might it be worthwhile to schedule the timing on a regular and recurring basis so that everybody can more easily ensure that the time is available? Perhaps at the same time on the third Friday of each month? Hi Peter, thanks for the kudos, we’re excited about this way to structure a nice, growing repository! To the idea of a routine schedule, that’s tempting BUT my resistance to that lies in a concern that some people might be systematically excluded by such regularity. Some folks for example might never be able to make a Friday, and any fixed time is apt to be bad for someone in the world (for example, 9am Pacific works great for North America, OKAY for Europe, and very poorly for Oceania!). Thus my leaning (so far) towards something a little more fluid. So far of course this is all just guess work, will see how it goes and will be listening for what would best serve the community! Great to hear about this. I think it ROCKS! Love how you make EVERYTHING so customisable. John, I’ve been catching up with CA today and love having access to the old webinars. Thank you so much, it is quite a motivating way to get re-engaged and up to date on some of the features I haven’t been using. Thank you! Hi Marney, you’re most welcome! Yeah, that we’re essentially creating a trove of useful content that is more or less evergreen for CA users is a beautiful bonus to hosting these. So glad you too are finding them useful! © 2019, JPL Consulting LLC. All Rights Reserved.